I assess the child's learning ability in the first class and then prepare an individual lesson plan. I break down math problems for the child, to make him/her understand in an easy way. I work with the child to develop his/her analytical skills. I give homework and test to assess his progress periodically. I teach kids at my place and if needed I come to your home to take classes. Rate details: For a group of two or more students, $40 per student per hour. I have taught many students in the past who had difficulty understanding the basics of Algebra. My strategy of teaching is to use a step-by-step approach, breaking a complex problem in small sections. I give them different kinds of problems for practicing the skills. I have helped students overcome their fear of Algebra. Algebra 2 is a continuation of Algebra 1. I have tutored students in Algebra 2. I have taught all the topics in Algebra 2 like linear relations and functions, system of equations and inequalities, matrices, quadratic functions and inequalities, polynomial functions, conic section, rational expression and equations, exponential and logarithmic relations, sequences and series, trigonometric identities and graph. It can be a difficult subject but with practice students can gain confidence and I work with them to build their confidence. I have taught the math section of the ACT one-on-one. I have provided information to students on test taking strategies like time management, and simple approaches to complicated problems. I have guided them when to use the calculator. We work together and with consistent effort students have performed ACT math section with greater confidence. I spent a lot of time trying to find the right tutor for my two high school juniors. I checked out Sylvan and Huntington and found both to be very expensive and each more interested in fitting my girls into the way their programs work (very different from one another) than in discovering what they really needed. So, I was more than thrilled when I finally found Shefali. My girls go to different high schools, one was failing Pre-Calculus and the other Algebra 2. Shefali sat down with each of them to learn about their needs and then created an evaluation test on her own time to better understand where they most needed help. My girls see Shefali twice a week, once during the week for homework support and for an hour each on Saturday for deeper learning and ACT prep work. They both like her very much, and so do I. She contacts me after each session and we discuss what they studied and any challenges they encountered, and there are challenges! Neither is a highly motivated student so it's not easy to keep them invested in learning more than enough to get by, but Shefali has somehow managed. It's been about six weeks, and my Algebra 2 student has already improved her failing semester grade to a "high C" which she believes will be "B" after her next quiz. My Pre-Calc student is making similar progress with a solid "C" and a quiz coming up on Friday. 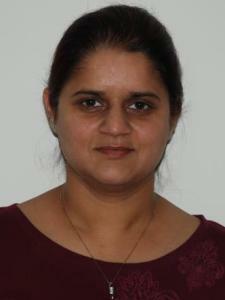 Shefali is very professional, likable, and an excellent tutor. Like me, you will be happy you found her. Ms. Shefali is an amazing tutor. She’s helped my daughter so much in math in just a few months. Can’t thank her enough for being so patient and kind with her. English, Maths and others. She is good with kids and engages them in studies in creatives ways. Punctual and accommodating. Knowledgeable and disciplined in her approach to teach. We should have started doing this a long time ago. My son got the understanding that he needed to make sure he understood the materials for his upcoming test. Shefali was very patient and made sure he understood the equations. Great tutor! She answered the questions what my daughter had. She explained it well and my daughter loves her. My daughter is struggling with Algebra and after taking some of the classes, she is feeling more confident. I recommend her. Blessed to have a tutor like Shefali, my daughter feels very comfortable and enjoys math class with Shefali. Once one session ends she eagerly looks forward for the next class. Taking classes with Shefali my daughter started loving math again which she had given up before. Thank you Shefali we owe you for that. Geometry. Shefali helped my child with concepts she was struggling with and made it simple to understand. Worked with my child's learning needs and style, and was flexible about times too. Shefali taught my daughter Honors Calculus and Trigonometry (11th grade). Shefali is very professional, patient and thorough. Elxtremly flexible with our busy schedules. My daughter is no longer frustrated with her math class. My 14 year old daughter wasn't understanding the concept of Algebra 1-2. Her teacher wasn't very helpful or probably just did not have time for extra help, so I reached out to Shefali and booked a 1 hour lesson. My daughter let me know that not only was Shefali patient, but also explained more thoroughly and she is starting to understand more how to approach each problem. Booked another lesson!! Pre-Calc: Very knowledgeable and encouraging. She teaches well in the core areas of the class and helps in the foundational skills that are necessary to be successful.